We are a leading Manufacturers & Exporters of Loading and Unloading Conveyors such as 90 degree transfer conveyors, PLC controlled integrated conveyors, Pallet return conveyors, pallet lifts and many more items from India. Our conveyors are custom designed and fabricated as per the needs of the application and can be customized for dimensions, conveying capacity & load capacity required as well as according to the material to be conveyed. We have over 30 years of experience in design & manufacturing customized conveyor systems for automated materials conveying. Our ISO 9001:2008 systems certified workshop is fully equiped with fabrication equipments and is located in Noida (Delhi NCR). Our automated conveyor systems are intelligent conveying systems that are custom designed to seamlessly integrate with the process flow and provide a backbone of material flow in any industry. 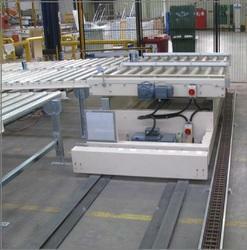 These conveyors are automated using high quality sensors, load cells, limit switches, barcode scanners, etc. which are controlled by a centralized PLC. The system is completely reliable with inbuilt logics and checks for material flow management. Our Pallet Return Conveyor provides automated return of empty pallets at the end of the line to the beginning of the line. 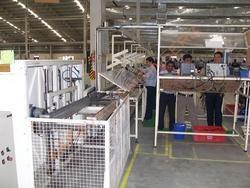 Our conveyors are completely automated with PLC based Logic control. There are safety interlocks amongst the main conveyor, pallet lifts & pallet return conveyor for a seamless continuous operation on the assembly line without any manual pallet handling. We design and manufacture a wide range of automatic conveyors for low cost process automation and seamless material transfer for different applications. Some of the common solutions are upenders, cross transfer conveyors, weighers, bar code applicators, bag sealers, vacuum line, CFL testing line and similar applications. Most of the solutions are PLC controlled with safety interlocking for reliable and safe operation every time. Please send us your requirements for these systems. We design and manufacture customized Rotary Conveyors or Turn Tables for high speed synchorized transfer of unit loads such as cartons, boxes, pallets, bales, etc. The conveyors are synchronized with the infeed conveyor the outfeed conveyor with PLC controlled logic safety interlocks for safe and reliable cross transfer of loads. The transfer angle can be customized to 90 degree, 270 degree or any other angle as per the requirement of the application. The Rotary Conveyor or Turn Table is mounted with a chain conveyor or a roller conveyor or even a belt conveyor as per the size of the load. Rotary indexing can also be done for multiple transfer outfeeds. 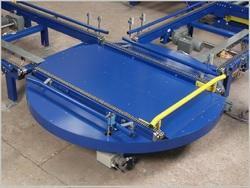 Please send us your requirement to receive a customized quote for these conveyors. The system has safety sensors and switches integrated and controlled by PLC logic for safe and reliable transfer of loads. Adequate sensors and switches are used for positioning of the shuttle and for switching on/off the conveyor. 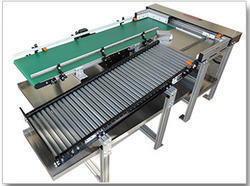 Please send us your requirements for these conveyors to receive a customized quote.